Jul. 13, 2018, 8:45 a.m.
A four-alarm fire consumed a junkyard on the border of Kensington and Port Richmond this week, and it was a big one. It took four hours for firefighters to get the blaze under control, and residents saw fireballs shooting into the sky. But chaotic as the scene was on Tuesday night, it wasn’t the first time a scrap fire struck the area — and it certainly wasn’t the most destructive. Twenty-two years ago, a giant tire fire ravaged a Port Richmond block. The aftermath included prison time and a several-month shutdown of four miles along I-95. For those who weren’t around back then — and those who remember it all too clearly — here’s a recap of what went down in the Great Tire Fire of 1996. 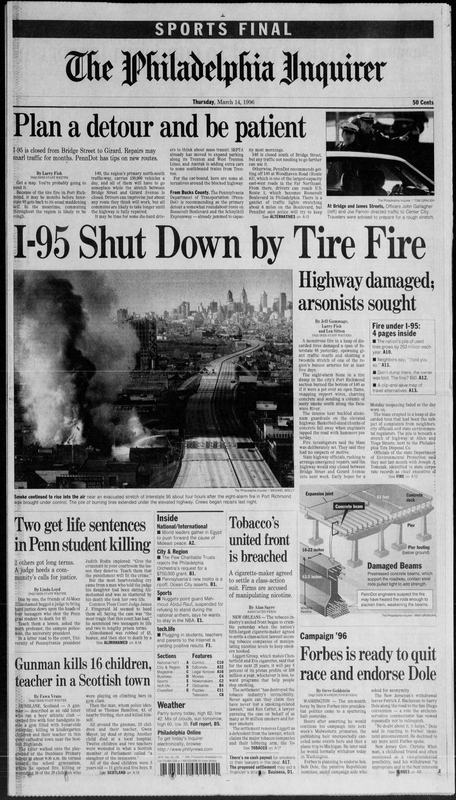 On March 13 of that year, a fire erupted on a 500-square-foot lot where a pile of tires was being illegally stored under I-95. According to the New York Times, which called the incident “suspicious” from the get-go, the blaze then spread to three adjacent buildings owned by the Philadelphia Tire Disposal Company. It burned for five hours, sent up smoke plumes visible for 30 miles, and reached a whopping eight alarms before the 180 firefighters called in managed to bring it under control. “We know there were at least 10,000 tires there, and that’s a low estimate,” Capt. Henry Dolberry, then-assistant to the Philadelphia Fire Commissioner, told NYT. The fire weakened the roadway substantially — basically melting it from the bottom up. The Pa. Transportation Department right away ordered more scaffolding to support the highway, but it wasn’t a speedy process. An entire four-mile stretch of the roadway was closed for eight days. As for the cause of the fire: right away, officials suspected arson. The Philadelphia District Attorney’s office sprang into action to investigate. Turns out, officials were right in their suspicions. Apparently a couple of dudes from Quakertown had a big stockpile of tires. When Bucks County ordered them to relocate the tires, they dumped them near the Philadelphia Tire Disposal site in Port Richmond. Then they conspired with two brothers, Joseph and Harry Tomczak, who owned the Port Richmond tire-dumping ground, to set the entire thing on fire — it seemed to them like the least expensive way to get rid of ’em. Sorry guys, but that was not only dumb, it was very illegal. The Bucks Co. men were charged with risking a catastrophe, conspiracy, trespass and causing a public nuisance. The Philly property owners were basically just on the hook for criminal conspiracy. Protip: Don’t store tires illegally. If you do, don’t set them on fire to get rid of them. Especially not right below I-95.